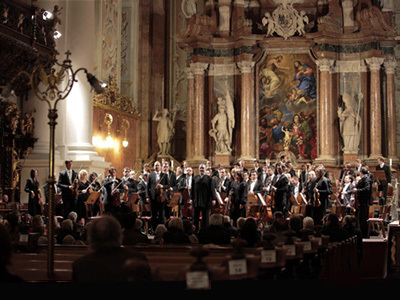 MUNICH — Under the incongruous stewardship of Valery Gergiev, the Munich Philharmonic intends to stress its Bruckner credentials the next three Septembers with filmed visits to the Stiftsbasilika St Florian. There, where the composer worked and rests, just south of Linz, the MPhil will record for DVD his numbered symphonies, three per visit, the orchestra said Friday. Gergiev: “In the Munich Philharmonic, dazzling technique is combined with a deep common experience on the subject of Bruckner … . I want people around the world to [hear this].” The partnership recorded the Fourth Symphony for CD in 2015 in Nowak’s 1953 edition. Orchestra statement: “The MPhil has a special and unique relationship to the symphonic work of Anton Bruckner, going back to its founding as the Kaim-Orchester, and over the years has … developed a specific Bruckner tradition. Painfully this supporting rhetoric omits mention of recent MPhil Generalmusikdirektor Christian Thielemann. He led stunning Bruckner concerts here before a foolishly managed struggle resulted in his resignation, and he is now filming his own Bruckner cycle in various cities — including Munich! — with the Dresden Staatskapelle. Filming at St Florian (pictured) begins Sept. 25 and 26, when Symphonies Nos. 1, 3 and 4 are scheduled; identical programs will be played at the orchestra’s Gasteig home days earlier. Details were unclear as to the editions. The project will open Gergiev’s third through fifth (of five contracted) seasons as MPhil Chefdirigent. This entry was posted on Thursday, July 6th, 2017 at 10:53 am	and is filed under Munich Times. You can follow any responses to this entry through the RSS 2.0 feed. Both comments and pings are currently closed.